They’re back! Well — at least sort of. In their first new appearance since drifting into eternity’s slipstream on the ashy whim of Thanos’ fateful snap, the dusted heroes from Avengers: Infinity War have made a fresh showing in a new promotional poster for Avengers: Endgame. From Groot to Doctor Strange to Spidey and more, the dearly departed Avengers all get the silhouette treatment at the bottom of the poster, and there’s nothing distinctively new about their appearance to suggest that any of them have gotten back into action since their last sightings in Infinity War. But unlike their black-and-white flashback appearance in the recent Endgame trailer, which lifts footage straight from Infinity War, at least here they’re still, quite literally, in the picture. The fact that dust still appears to be swirling up from the ground around them also makes us wonder whether the poster is strictly paying tribute to the dead, or if it’s subtly trying to tell us something about their possible futures. 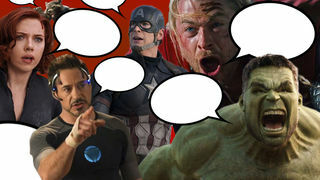 But with plausible back-from-the-snap theories ranging from rewinding time (which could explain Vision’s appearance here) to everyone simply being absorbed by the Soul Stone (which might not explain how a super bot, murdered before the snap, could come back to life), there’s no shortage of scenarios to keep those wheels of speculation turning. Even as Marvel keeps playing its Endgame cards close to the vest, it’s nice to see Valkyrie appear here in her first group shot, and we’re pretty interested by Captain America’s return to a conventional shield, as well as Nebula’s new outfit. Are these just more red herrings from the Russo brothers to keep us off the right path? If Thanos knows the answer, his deadpan look in the poster isn’t giving anything away. But with April just around the corner, we’re literally in the endgame now. Avengers: Endgame opens in theaters everywhere April 26.